Grow your vocabulary & improve your French skills with these 10 engaging intermediate French short stories! 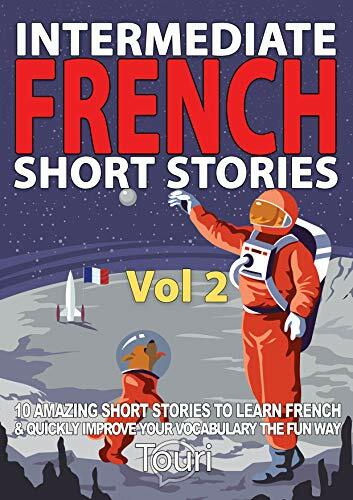 Intermediate French Stories Volume 2 is packed with even more breathtaking tales to catapult you to French speaking fluency! There are so many reasons to learn a new language. Just imagine the experience of real French culture and fun activities with locals that you will never forget for the rest of your life. The best way to learn a new language is by reading and building a strong base of vocabulary. In this intermediate French book you will find yourself mesmerized page after page to each captivating story that will keep you so engaged you’ll practically forget you’re even learning French! 10 engaging short stories that range from a magical genie, a colorful world of fairies, life lessons and even outer space voyages! Filled with unexpected plot twists among other topics that you will find easy to understand and relate to. Carefully written stories with you as an intermediate level reader in mind, using easy to understand grammar and commonly used words so you can enjoy reading while learning new grammatical structures without being overwhelmed. At the end of each chapter there is a comprehensive guide specially designed for intermediate level readers. You will find a vocabulary list of some of the words from the story as well as a summary in French and English to make sure that you understand the tale completely. Chapter by chapter you will find yourself effortlessly reading each story. Not struggling like in boring reads or basic French textbooks. You will become captivated by reading the dialogue of the characters and learn how to express yourself in different contexts. Most importantly you will see massive growth through new French words that will get you closer to your goal of becoming fully conversational! Enjoy the book and remember to have fun on your French learning journey! So scroll back up and grab your copy of Intermediate French Short Stories Volume 2 right now!